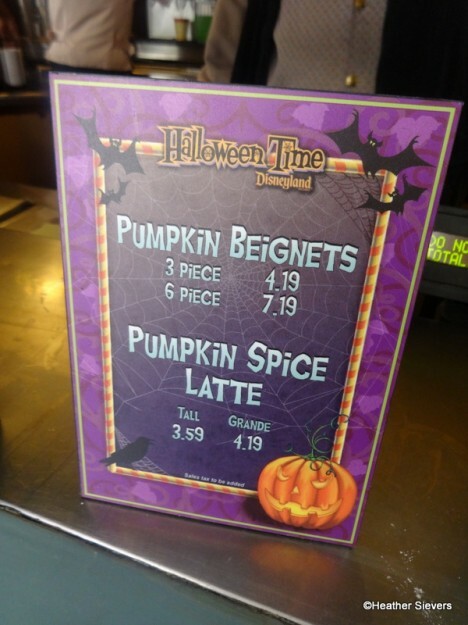 Fall is here and the Disneyland Resort is full of lots of amazing seasonal treats. If you know me, you know this is my very favorite food season and anything with the word “pumpkin” in the title is something that you’ll find me ordering. Two things that I recently devoured, both located at Disneyland, are the Pumpkin Fritters from Royal Street Veranda and Pumpkin Beignets from the Mint Julep Bar. Both are mouth watering, but I do have a favorite… . 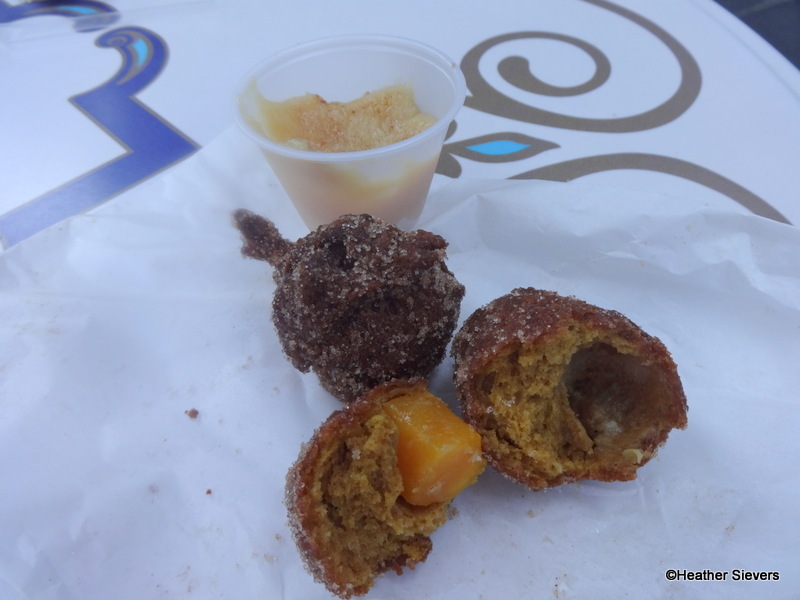 In my book, the Pumpkin Fritters reign tastiest seasonal pumpkin treat. But don’t worry, if you prefer the Pumpkin Beignets, I’ll still be your friend! 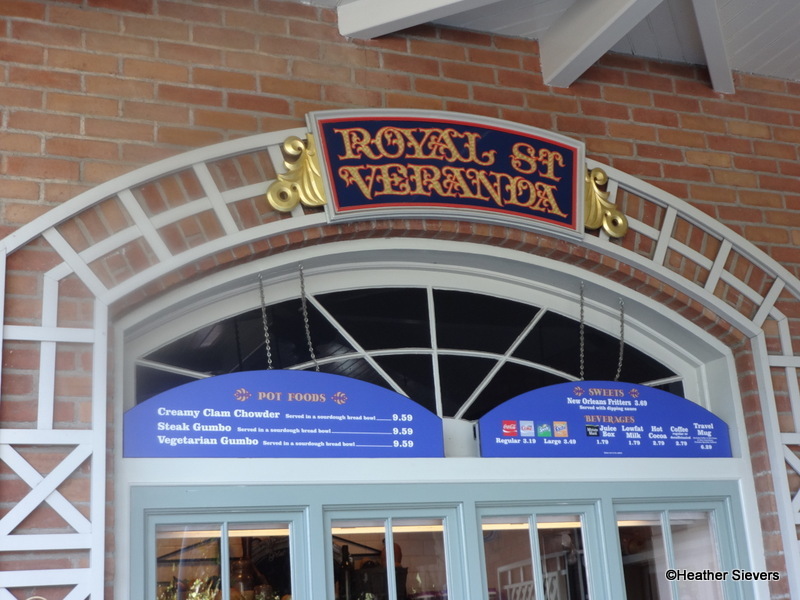 Pumpkin Fritters can be be found at Royal Street Veranda near Pirates of the Caribbean. Known for their chowder in a bread bowl, this great little spot also serves fritters. Normally the fritters are apple, but this year they have seasonal Pumpkin “Squash” Fritters! For $3.69 you get a very generous portion of 5 fritters and a container of dipping sauce. 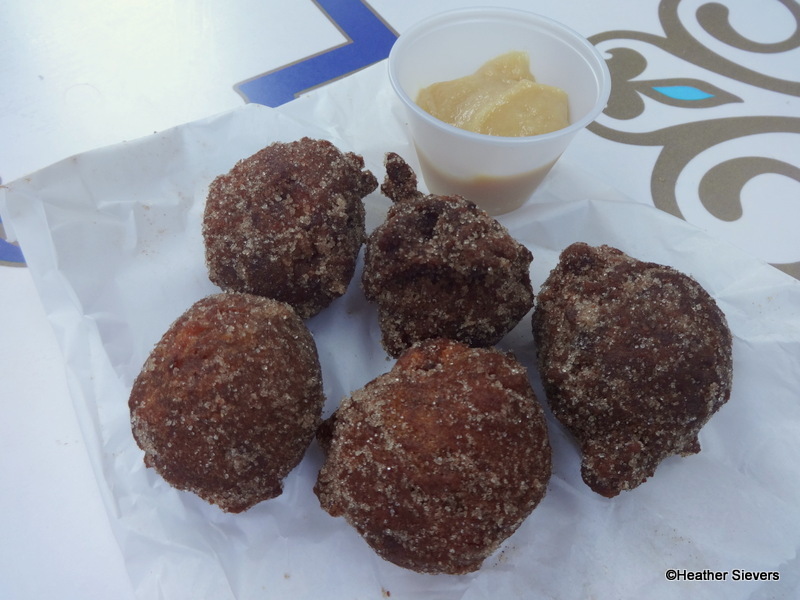 About the size of a donut hole, the fritters are crispy on the outside with a soft center. They’re dusted with a cinnamon sugar sprinkle and served up piping hot. I was pleasantly surprised to see actual pumpkin chunks when I took my first bite! In my world, the fritters taste exactly the way a perfect pumpkin holiday treat should; a little bit of sweet, a little bit of spice, and with a dunk into the vanilla dipping sauce, they are heaven. 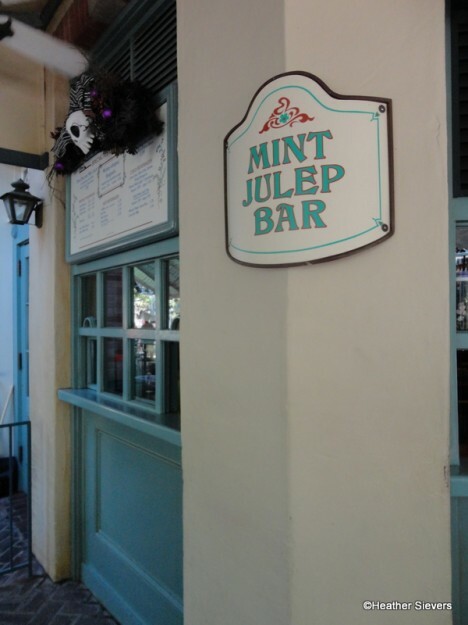 Over at the Mint Julep Bar, you can find another heavenly pumpkin treat. 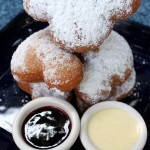 Mickey Pumpkin Beignets! 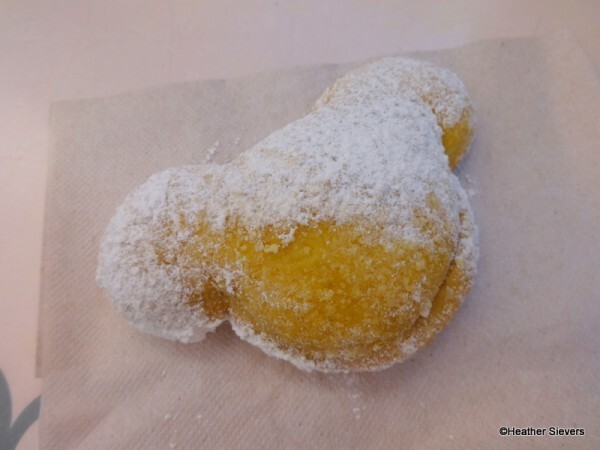 A seasonal friend of the regular Mickey Beignet, these Pumpkin Beignets can be purchased in lots of 3 or 6. I grabbed a 3 pack for $4.19 and settled in to the French Market seating so I could enjoy a little Jazz (courtesy of the Royal Street Bachelors) with my beignets. I almost always have to wait for beignets when I order them. 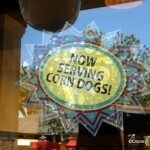 This is a good thing though, because it means they are a hot fresh batch, straight from the fryer. On this visit, I was handed my bag immediately. They were warm, but not piping hot like usual. By no means am I complaining, just a beignet observation. I actually don’t like them burning hot, because that means I have to WAIT to eat them… This batch was ready to go with no cooling off period necessary. 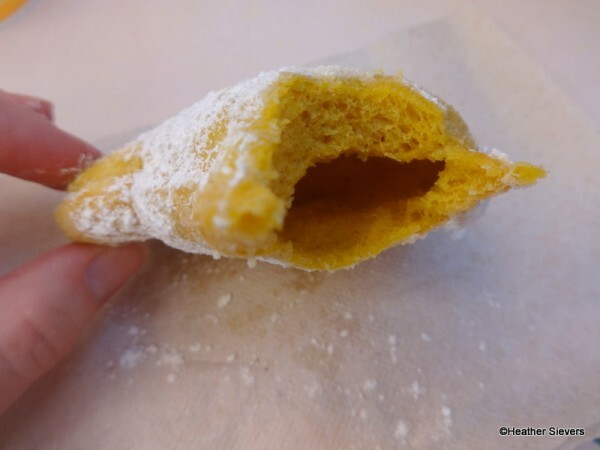 I first tried Pumpkin Beignets last year. I really do like them, but upon giving them a second chance this year, my feelings remain the same. They are good, but just not pumpkin-y enough to my liking. 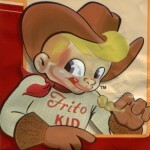 The taste is very subtle which may be your thing, but it’s not enough for me. I love the powdered sugar coating, the hint of pumpkin & all spice — but it is very very minimal. More of an aftertaste than a solid pumpkin flavor. If I had to choose between regular beignets and pumpkin, I’d go with regular. SO, in my book the Pumpkin Fritters win! They also get bonus points for cleanliness (no powdered sugar to clean up, which means no evidence of your splurge) AND they are a bit cheaper too! If you haven’t had them, get over to Disneyland and taste for yourself. Both snack stops are located just steps from each other in New Orleans Square. So, you be the judge! Grab a batch of each and let us know what you think. 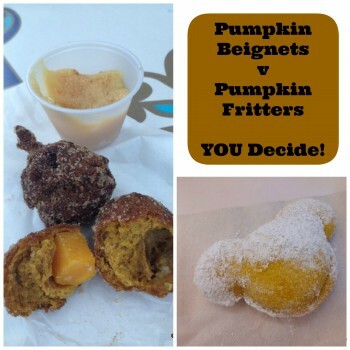 Have you tried Pumpkin Fritters and/or Pumpkin Beignets? Which are your favorite? 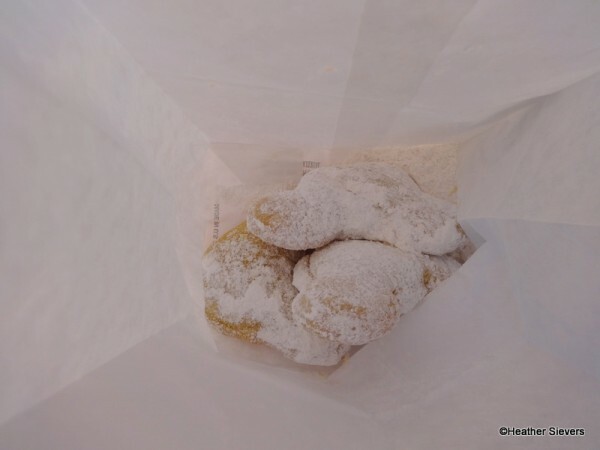 I really miss the gingerbread beignets from a few years back…they were awesome! I only go to the ‘World’ rather than the ‘Land’, but I would def choose the fritters. WDW has the Crystal Palace which I have to go every trip to get their crispy French Toast. It’s crunchy outside and soft outside and has granulated sugar all over it. It looks like your fritters and I love it, so I’m sure the Pumpkin Fritters would be delicious! Being a ‘Brit’ I have never heard of these obviously American delicacies – but would certainly give them a try next time we visit disneyworld. 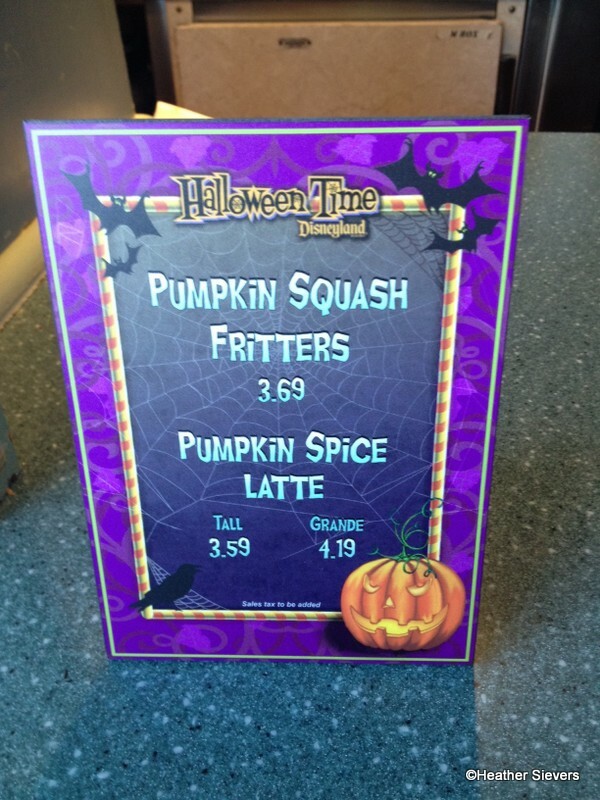 I wish that WDW would serve the pumpkin fritters and the pumpkin beignets in the parks, or at least in POFQ. @Tom – I believe they will be around for Christmas time! Will keep you posted. @Samantha – I was surprised about the pumpkin chunk too! @Angelina – Yes! It is similar. 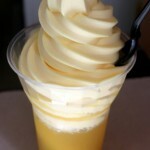 @Carolyne – You’ve got to come to Disneyland for these ones! 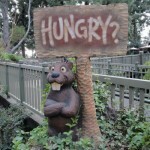 @Ken – Come on over to Disneyland! Do you know how long this will be available?? We’ll be there on the 8th of Nov, but it looks like those are Halloween signs. My husband loves pumpkin anything so he would be in heaven!! @Glory: As far as I know through Halloween, but I am keeping my fingers crossed that they will stay a little longer.